The latest Rush Rally game has an impressive amount of modes and control options, making it the most approachable racer on mobile. Racing games are a tough breed to get just right on mobile. Touch controls and small screens are just ill-suited for games that reward quick, precise reactions to changing conditions, or controlled maneuvering as you look down the road at the next turn to attack. Considering this, it's frankly astounding that Rush Rally 3–an off-road racing game built to bring “console quality” racing to mobile–works as well as it does. Rush Rally 3 is delivers nothing but pure racing goodness that feels right at home on mobile. Rush Rally 3 reminds me a bit of the Sega Rally games, but with a bit more of a focus on realism. It's a racing game intensely focused on teaching you about its tracks--with their changing surfaces and terrain--and then challenging you to push cars to the limit to set the fastest time in mostly point-to-point races. All the while, it's got a look that feels a little dated, but in all the right ways to make you feel like you're playing your favorite old school racer. This game doesn't just try to stick to serving up nostalgia, though. Although the game has a pretty stripped down menu interface and flavorless Career Mode, the driving model here feels as cutting edge as its ever been on a mobile platform. Also, Rush Rally 3 sports pretty much all the helpful bells and whistles you might expect from a serious, modern racer, including driving lines, realistic physics, tuning options, and more. Just by looking at Rush Rally 3's menu layout, the game is focused around a single-player Career Mode, where you compete in strings of races for points in return for money, which you can use to buy more cars. This is a fairly standard offering for most racing games, but Rush Rally 3 does not stop there. Not by a long shot. In addition to this mode, Rush Rally 3 has three variations on one-off racing modes, a set of skill games (that have you doing stuff like driving through traffic or avoiding missiles), a hot lap mode for competing to post the fastest times to the game's online leaderboards, and four-player online multiplayer. No matter which one of these modes your playing, you're constantly being rewarded with money that you can use to unlock that next hot ride. If tons of race modes weren't enough, Rush Rally 3 also just so happens to have a huge variety of tracks, cars, and car customization options to ensure you're always digging into something new when you boot it up. Everything mentioned to date would not really be worth mentioning if Rush Rally 3 didn't bring its racing to mobile in a way that feels both accessible and challenging. Too many mobile racing games miss the mark in this regard, but Rush Rally 3 nails it, and in a way that doesn't make anything feel dumbed down compared to racing games on other platforms. The secret to success for this game lies in just how customizable it is. 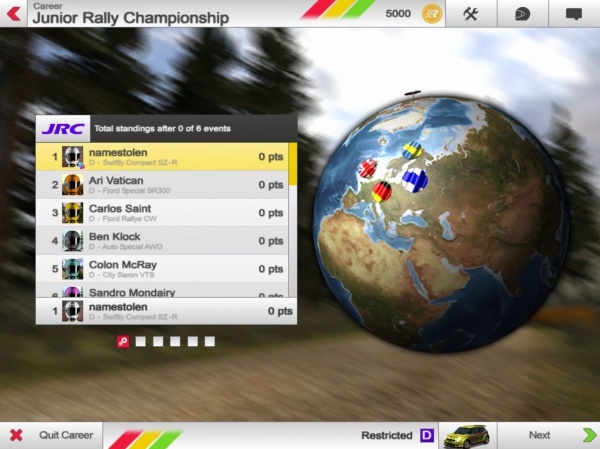 There's tons of tilt and touch control options to choose from, different assists and difficulty tweaks you can turn on and off, a whole host of camera angles to make sure you have the best view of the action, and even an extremely detailed graphical settings menu to make sure your time with Rush Rally 3 runs buttery smooth, even on aging hardware. No matter whether you are playing this game with an MFi controller on an iPad Pro, or are using touch controls on an iPhone 5s, there's a setup in Rush Rally 3 that can give you an appropriately challenging and fully-featured racing experience. I can't really say there's other racers out there that pull this off quite as well, making Rush Rally 3 truly the definitive mobile racing experience.